I couldn't think of a better image to start off Photo of the Fortnight! 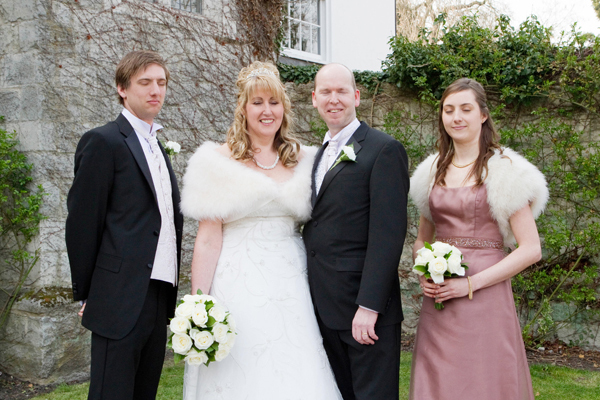 This was a beautiful wedding at the Archbishops Palace, Maidstone, back in 2011. It wasn't until I was editing all of the images that I noticed every single person in the photograph was blinking! What are the chances??! Surely when you are having your photograph taken you are trying to keep your eyes open, so the fact that four people are blinking at the same time I thought was quite incredible! A friend of mine is a financial analyst and actually worked out the chances, which are 1/104,976! Based on the average person blinking 10 times a minute for approximately 1/3 seconds each time, at any given time there is about 1/18 chance of capturing them blinking. For all four to be blinking that's 1/104,976. Wow!